Seaweed must be dried within a day or two of harvesting. Drip dry over a covered clothesline out of sunlight. Or over stove. Or in hot press. Not necessary to rinse in fresh water, unless you are avoiding salt. 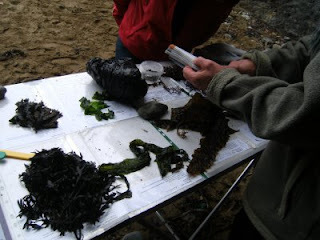 Except in the case of Slouchan – purple laver / sea lettuce, which needs lots of rinsing to remove sand etc. Briefly rinse, then soak kelp (2 x 6 inch pieces) overnight. Add to 3L water with parsley stalks, bouquet garni, few porcini mushrooms. Boil for 15 - 40 mins or longer. Strain. Use in combination with your normal stock initially at least. Kelp (Oarweed / Kombu) can be used again e.g. for tendersing beans. Compost it when finished. Briefly toast and grind in pestle and mortar: Dilisk, Alaria, Bladderwrack, Channelwrack, Sugar Kelp, Sloughan (Purple laver/Nori). Mix all or some of these and use sprinkled on poached eggs, soup, salsa, salad. This will give you full spectrum of trace elements, minerals and vitamins. Add Alaria to rice like this for a “chickeny” flavour. Put 1-2 inch pieces of Sugar Kelp, Kelp or Dilisk in a hot oven until they crisp –3-5 mins. Sugar kelp and kelp are very high in iodine, and should only be eaten very occasionally. Salads: Sea spaghetti (Thong weed) and Alaria (Winged Kelp/Wakame) can be marinated and added to salads. Alaria (winged kelp) Soak 1 cupful / or 2 * 6 inch pieces dried) in tepid water for 20 mins. Saute for 1 min : 1 tbsp soy sauce; 3 garlic cloves; 2 tsp honey; 1 tbsp olive oil; 1 tsp grated ginger. Add the Alaria and little soak water, bring to the boil and simmer for 40 mins, until the mid-rib is soft.. Add soak water if needed. Remove from heat and add a dash of sesame oil and more honey if needed. Serve mixed gently through salads or as a side dish with grains. 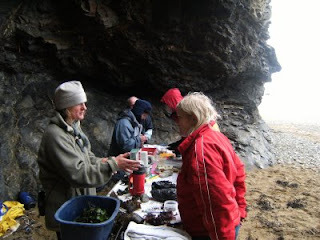 You can make pesto, salsa, pate, pasta, breads, scones, mousse, carrot cake and even ice cream with seaweeds. Watch out for a new Seaweed Cookery book by Dr. Prannie Rhatigan with recipes for these and more. In the meantime, to get you started here are 2 of yesterday’s recipes. The soup was Butternut squash, but you could use the stock for any soup. Preheat oven to 210 c / 410 f/ Lightly grease 2 baking trays. Fry onions and garlic till soft, mix in crumbled dilisk towards end and allow to cool. Sift flour, BP and C of T into a bowl. Stir in mustard and cayenne. Dice and rub in butter until it resembles fine breadcrumbs. Add almost all egg/milk in a well in centre and mix gently. Stir in cheese along with cooled onion/dilisk mixture. (I prefer to add all these before the egg/milk). Turn dough onto floured surface and flatten or roll to just over 1” thick. Stamp out scones, brush with reserved milk/egg mixture and sprinkle cheese on top. Bake for 12- 15 mins. Put milk carragheen and 1oz/25g sugar in saucepan and bring to boil. Then simmer for 15 mins. Chop chocolate into small pieces or grate, remove milk etc. from heat and stir in chocloate until melted. Strain this mixture. Lightly oil 4 teacups, pour in choc. Carragheen and chill until set. Heat rest of sugar and water gently in heavy based saucepan until sugar dissolves and reaches pale syrup stage. Pour in coffee & stir over gentle heat until smooth. Remove from heat, cool and add whiskey. Leave to cool. Invert each mousse onto a plate and pour sauce around. Decorate with grated choc. And cream. Use bunch of Fucus Serratus or Bladderwrack in your bath to soften and refresh skin. Use Kelp (Oarweed) to improve soil condition and nutrients. October: Wash in fresh water, then shred and place on soil. Fork it in. Or lay on top of soil and cover with black plastic until ready for spring planting. Use as “collar” / mulch around plants to keep slugs away. Add rinsed seaweed to your compost to activate. Observe safety when collecting on rocks. Start one hour before low tide and keep facing the sea. Wear strong slip-proof and waterproof footwear. Only take what you need. Cut off a piece of the frond (“leaves”) rather than pulling the whole plant from the rocks. Remember, lots of other species need the seaweed to live on! Pick from areas you know to have clean water.